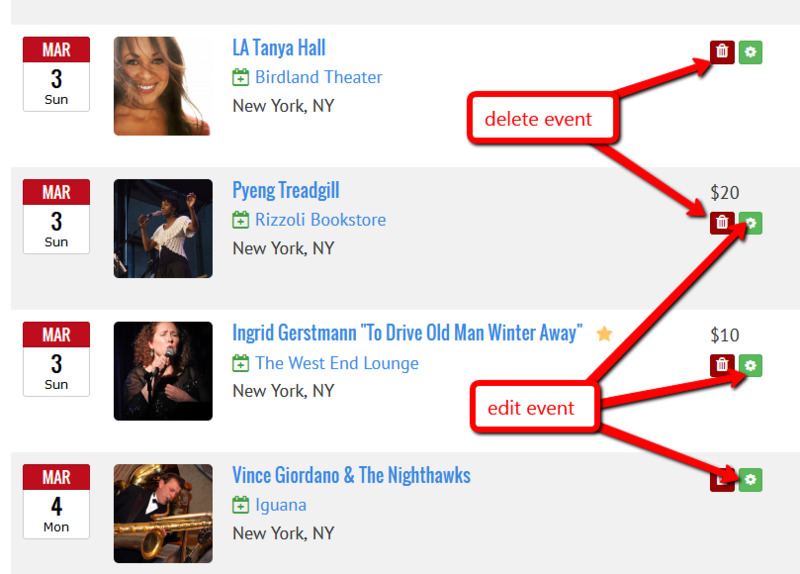 As a Jazz Near You Administrator, you’ll maintain your city's event, venue and festival guide. This means making sure what we present is accurate, current and complete. To start, we recommend making a pass through the venue directory and merge duplicate venue listings, mark closed venues, and correct any glaring address issues (e.g. city name included with the street address). Repeat for festivals, then review the remaining directory items. If you accidentally delete a venue, contact Michael Ricci and he will restore it for you. Once the directory is up to date, you can turn your attention to the events. 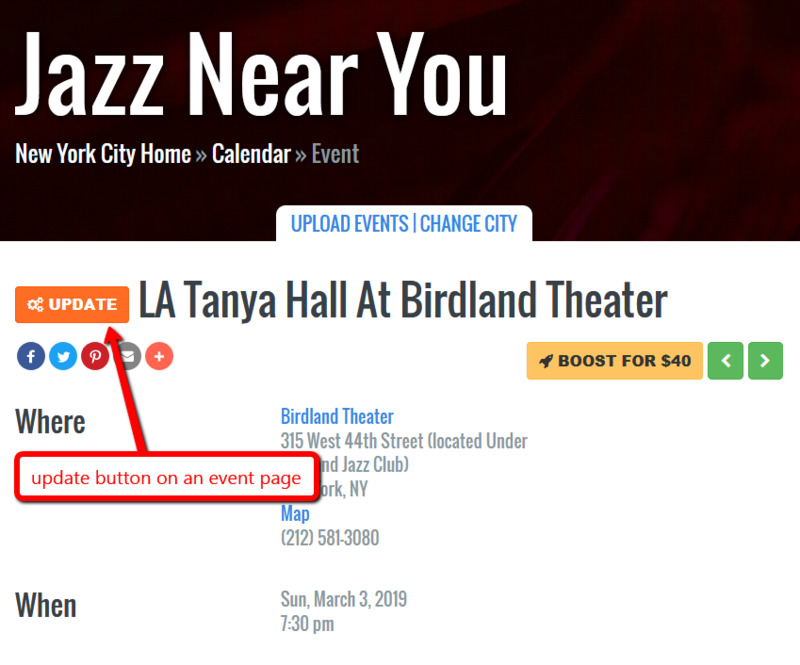 Events arrive at Jazz Near You via our upload form, a CSV file, or a feed import (Dizzy’s Club Coca-Cola and Blue Note New York use this method). We also import events from ticketing services and music event aggregators including Bandsintown. We identify the source on each event detail page. Venues like Blue Note and Village Vanguard present two sets and we show those two sets as two separate events. Please do not delete set #2. Report all obvious non-jazz events to Michael Ricci so he can delete and block them. We allow some pop jazz (e.g. Steely Dan or Rickie Lee Jones), blues, jam and prog rock bands (e.g. Los Lobos or Phish). Typically, if we cover a musician or band at All About Jazz, we'll include their events in the Jazz Near You calendar. Venue information is uploaded by musicians, by the venue itself or is imported from an external file. You may encounter two or even three versions of a venue and when you do, merge them into a single listing. You’ll want to keep the one that is the most complete and that's typically the original version (FYI, the lower the ID, the older the listing). When you merge two venues, we also merge events and poll votes. 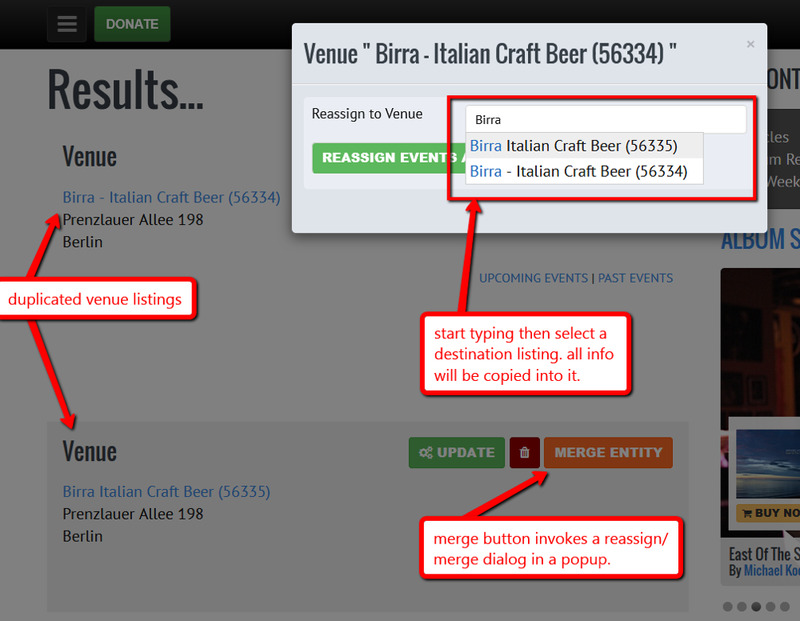 To merge two venues, search by venue name, then from the results page, click the orange "MERGE ENTITY" button, enter the “Reassign to Venue” name value, select it from the dropdown, then click the green "Reassign" button. 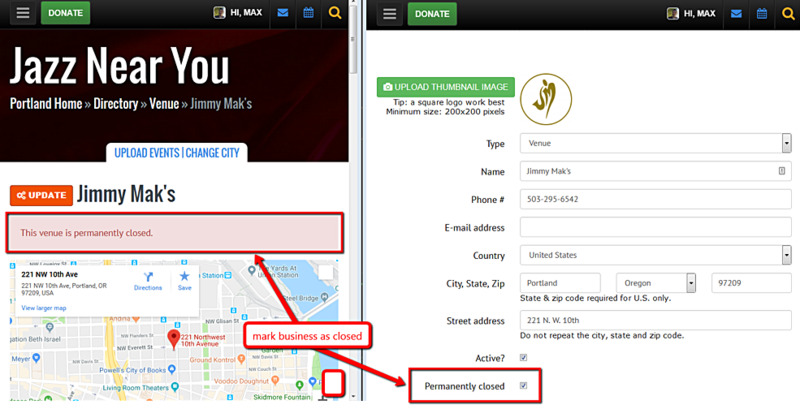 If a venue has closed, then mark it as such—do not delete it. This can be done from the venue update form by checking the “Permanently closed” box. We keep closed venues as they may have past events associated with them and we archive all past events uploaded to Jazz Near You. As an administrator you will see various buttons on all pages. The most common are the orange update button, the green gear icon (which takes you to an update form) and a red trash can icon (which deletes the record in question). Distinguish your Jazz Near You city website with a header image. If you have access to photos or can secure a photo through your city's visitors bureau, please let us know. We size the header image to 1920 pixels wide x 402 pixels high—view some examples here: Philadelphia, Kansas City, Istanbul, Pittsburgh, Paris, and Copenhagen. Jazz Near You is a powerful platform with great potential. The more concert goers, presenters, venue owners, and musicians who use it, the more powerful it becomes. As an ambassador to the platform, you can raise the awareness of Jazz Near You in your city and help boost attendence and ticket sales. If you have any questions or ideas on how to improve Jazz Near You, contact Michael Ricci. JNY is a collaboration of people who deeply care about jazz and are creating innovative ways to support the music.